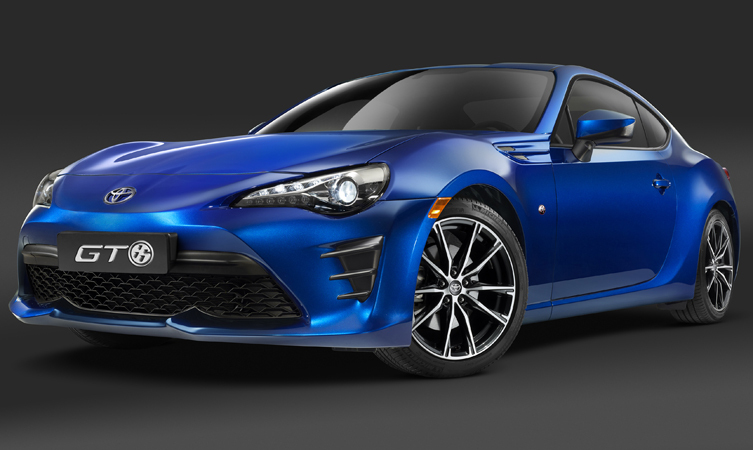 The 2017 Toyota GT86 will be revealed for the first time at the New York International Auto Show next week on 23 March, ahead of going on sale towards the end of this year. The sports coupe will display several styling tweaks inside and out, as well as updated suspension for even crisper handling. The visual changes are led by more powerful styling elements, including an enlarged central air intake, which emphasises the coupe’s low and wide stance. 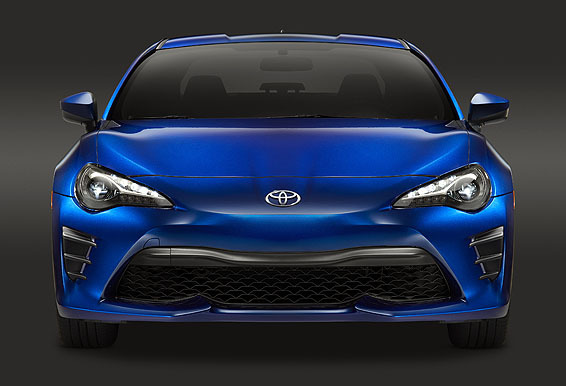 The front end also gains a restyled bumper, fog light housings and LED headlamps and turn indicators, and there are new twisted-spoke alloy wheel designs. Inside, the updates focus on improved sensory quality, with new combination leather and Alcantara upholstery and Alcantara-wrapped instrument panel options. The soft-touch, suede-effect material is also featured on the door trims. A new cloth upholstery will be available with contrasting silver stitching. 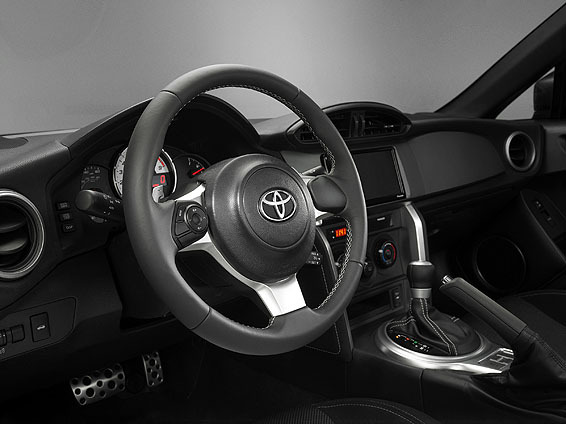 The sports steering wheel has a new look, too, with integrated audio controls and an 86 logo on the centre boss. 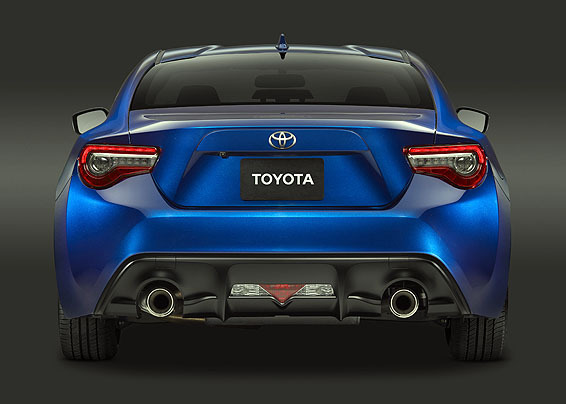 The GT86’s credentials as a definitive driver’s car are reaffirmed by suspension changes, with revised shock absorber tuning and spring rates delivering easier control and increased agility. The powertrain is unaltered, retaining the car’s distinctive combination of a front-mounted, naturally aspirated 2.0-litre ‘boxer’ engine driving the rear wheels. Toyota has made the GT86 a key part of its motorsport programme, harnessing its abilities for both race and rally competition. The GT86 CS-Cup has been developed specifically for a racing programme at the Nürburgring Nordschleife circuit, while the GT86 CS-R3 is available to customers for rallying at all levels of the sport, from grassroots to FIA-sanctioned events. The UK will not be taking the engine updates. However, both the exterior and the interior of the vehicle have been updated. Many thanks! Think I’ll wait for the updated styling/handling – why buy an old model??? Hello, I’m really interested in this new version, and I want to buy it as soon as possible. Do you have any approximate date/month of release in the UK? Hi Osama, we haven’t been given an exact date for the UK release of the 2017 GT86. Stay tuned to our blog/social channels for more updates coming soon. Thanks. Thank you for your reply. Are you able to give me a rough idea about the time when the car will be available. Maybe based on previous years. Are we looking at next three to four month, last three month of the year or early next year? Hi Osama, sorry we haven’t been given any indication on when in 2017 it will be available. Thanks. At this rate it’s looking as if it will be available after its new rival, the Mazda MX-5 RF. I think I’d need to see old and new side by side to make a judgement on which I prefer – some bits yes, others no, most likely. But the switches on the steering wheel are definitely a plus, as are any changes that make the handling still better (I thought there was talk of a stiffer rear sub-frame or similar?). Unbelievably, no reversing sensors in 2017 (even the Aygo gets a camera!) and no rain-sensor wipers available – would be a plus when you want to be 100% focussed on the road. More Alcantara is a nice idea, but not at outrageous option prices. Some badging gone at the back – saves both cost and the need to remove it, I guess! Thank you for your post. We are glad you like some of the new features of the 2017 GT86. Stay tuned to our blog for more information and specifications released throughout the year. Many thanks. Front bar is hideous, but the taillights look cooler then the altezza-like originals. Glad I got the OG model.